I think I've mentioned that my sister-in-law, Darin (who is practically perfect in every way), is a fantastic cook. I think all the women in my family cook well but Darin's recipes are always, always a hit. For example, once we tried Darin's Creamy Garlic Vinaigrette every Sunday dinner salad had this dressing on it. David is an avid fan of pasta salad so for his birthday I made this along with grilled shrimp and steak with mushroom sauce. It was delicious! Blend together (I use my Magic Bullet) until emulsified. seriously though, darin really is ppiew. i love her! and i have a feeling i'm going to love this. must make. This looks great! I will be adding it to my food board on Pinterest! 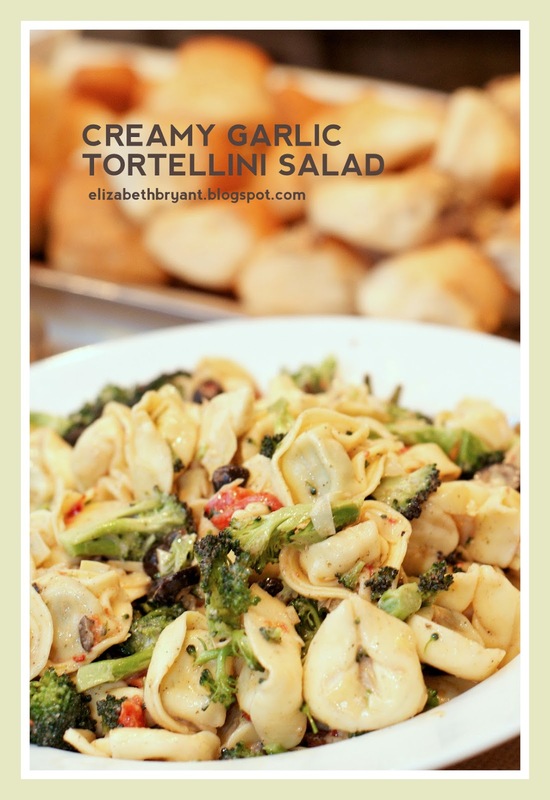 Do you cook the tortellini? I'm wondering the same thing...do you cook the tortellini? Hey, found this recipe on pinterest, and just thought I would let you know I have already made this 4 or 5 times! Thanks for the recipe! I've made this salad three times now, and have whipped up the dressing on an additional three occasions. I simply love this recipe. Thank you for sharing. Do u cook the tortellini? I can only buy frozen here!